Late last November, we snuck off to the County and took possession of our cottage. The cottage resort itself was closed (it'll reopen in April) but we were able to move in much of the new furniture we had been storing in our garage. I thought I'd give you a quick tour and show you how things look. Sorry for the poor quality of the photos. Most of these were taken late in the afternoon (which in November is almost pitch black) and I've had to lighten them in Photoshop so the colours might be off. Come spring, we'll get to doing some DIY projects, get the rest of the furniture in place, and really start to enjoy our summer home. Here's the view from the front door towards the living room. 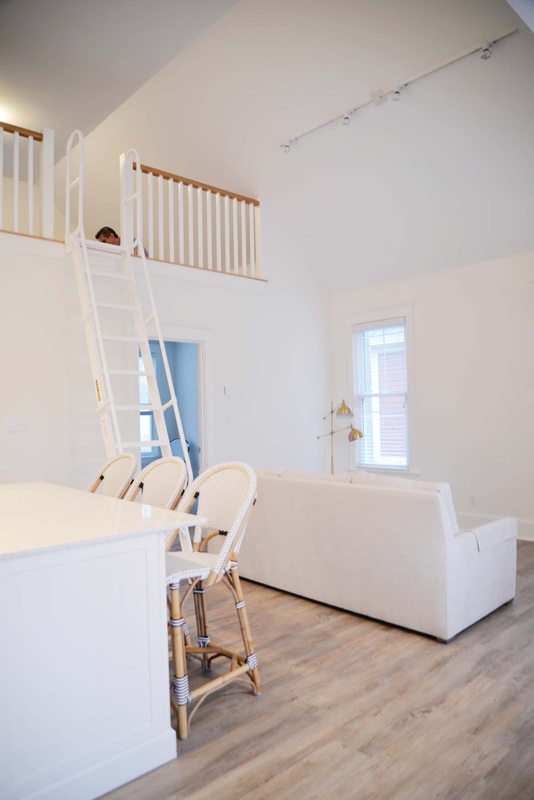 The lofty ceilings really make the cottage feel open and airy. 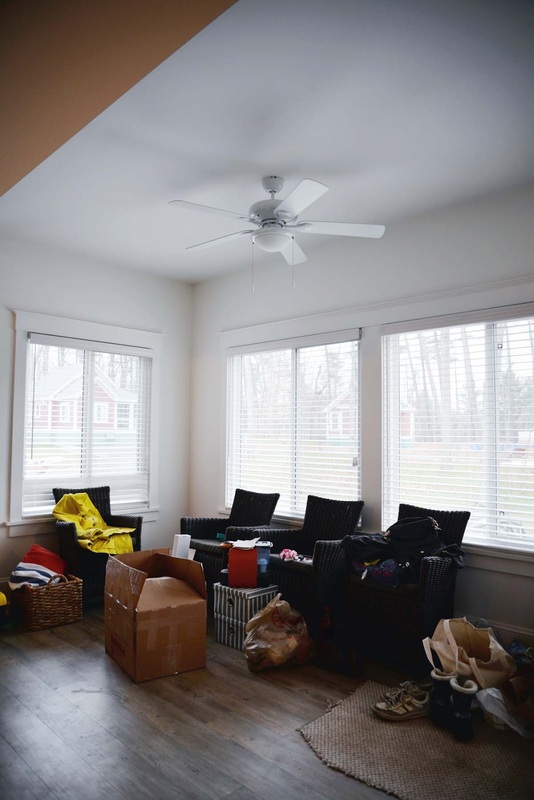 Everything was finished beautifully; the paint, trimwork, floors, and carpet were just as expected and there were hardly any deficiencies noted during the inspection. The Serena and Lily Riviera counter stools were a splurge but I just knew I wouldn't be happy with anything else. 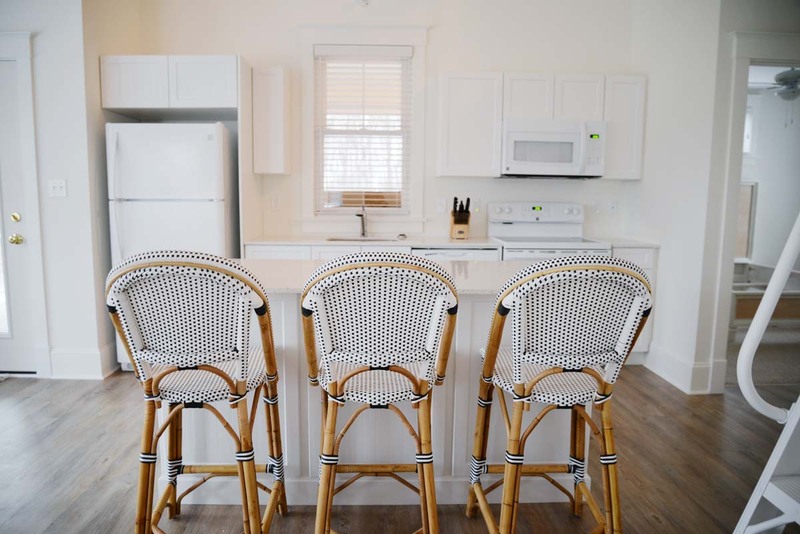 We plan to have this cottage for a very long time and these chairs are a classic that won't go out of style. They're made of rattan and woven plastic which will be easy to keep clean and they're stable enough for a young girl who rarely sits still (I'm talking to you Chloe). The kitchen has ample storage but definitely needs some colour. In the backsplash maybe? I asked them to leave the handles off as I want to source my own. We have a black swing-arm sconce for above the window and I'm leaning towards mixing metals and using brass handles (these ones would be a dream). 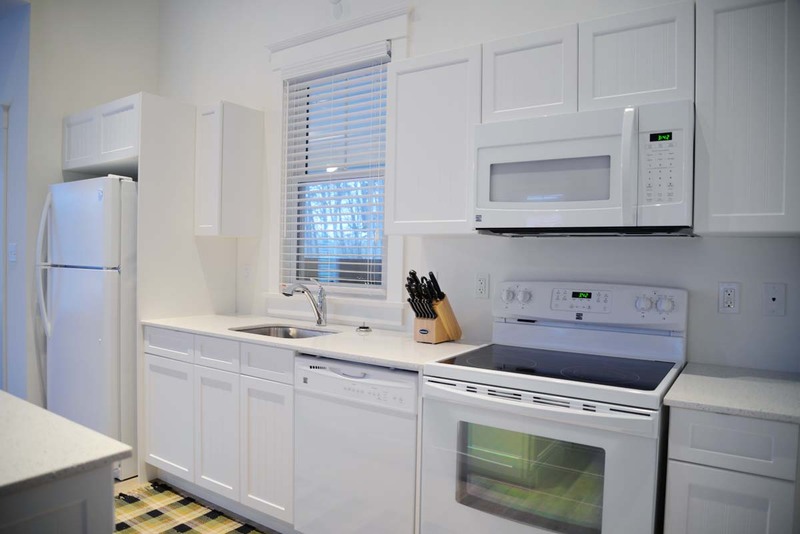 We debated white or stainless steel appliances, but budget won out and we kept these white but opted for the Ceran cooktop. White, white, everywhere. The sofa was another item of debate: do we go for the practical dark colour or go for light to keep things open and airy? We will be renting the cottage out at some point so you do need to consider those types of things. I have a philosophy though that guides me in most "house" related decisions: get the best you can afford and get what you really want because tomorrow may never come. I'm very much of the mind that you 'use the good dishes' and stop holding onto them for 'someday'. Ultimately, this cottage is for our enjoyment and we shouldn't let the possibility of a red wine spill deter us from getting the cream sofa. We can always get a slipcover, right? Here's the dining area, piled with junk. We'll be using these Canadian Tire outdoor wicker chairs around a custom table built by Chris. If you need custom wood furniture, she's your girl! I'm on the search for just the right light fixture to replace the fan overhead. Any suggestions?? 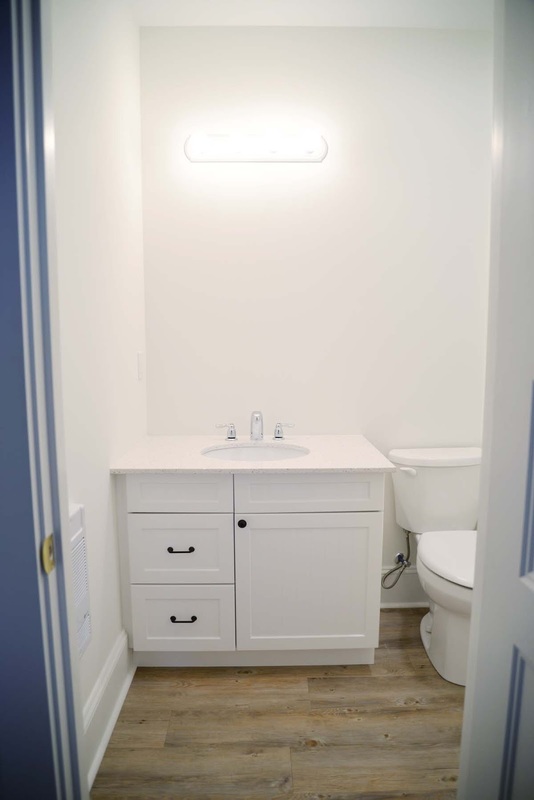 Onto the main bathroom. I asked them not to install the mirror as it would be one of those frameless ones glued onto the drywall. I've already purchased an awesome light fixture to replace the strip lighting. This is Chloe's bedroom. A simple bed, trundle, and dresser are pretty much all she needs. She has room for a small side table and a bookcase but I think we'll spend our time looking for vintage ones. We can't have everything looking too new! We managed to get our bed assembled too. I really love the rattan headboard and distressed finish which feel suited to a casual summer bedroom. 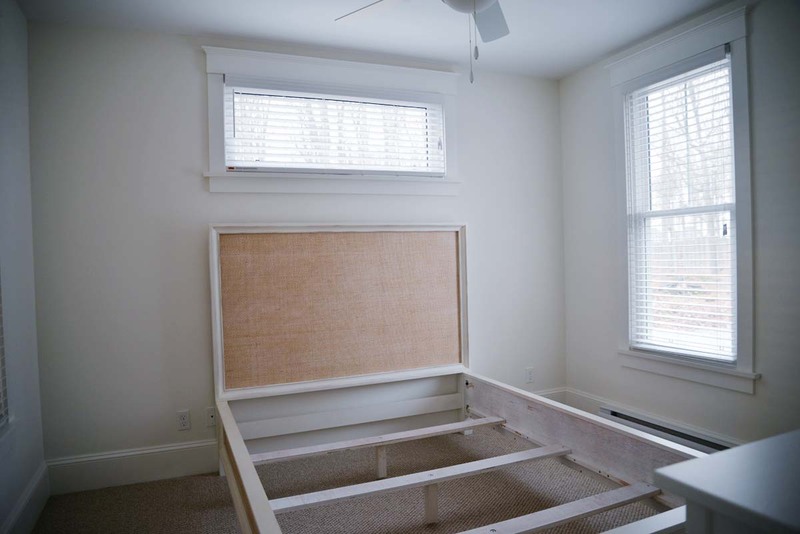 I do have to tell you that we put in the boxspring and mattress and the bed looked really big and high for the space. But, I'm reserving my judgement until we get side tables and lamps in and dress the bed. 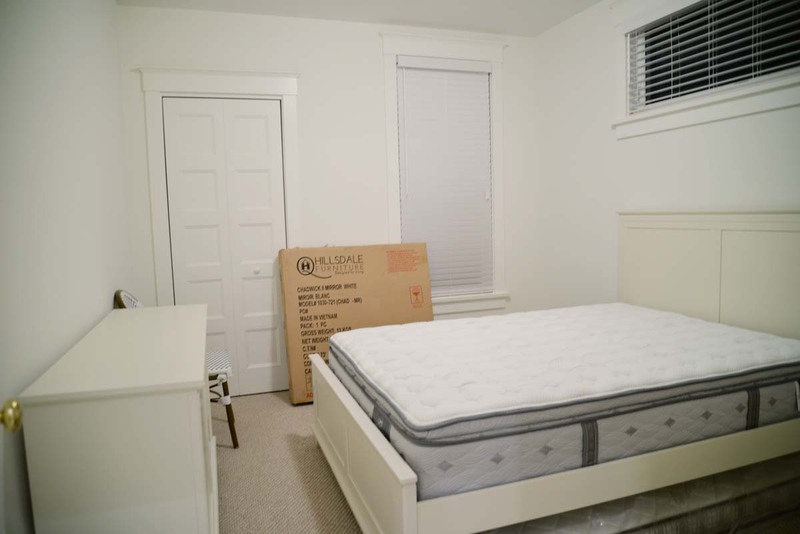 Empty rooms can be deceiving. And then there's the loft. The ladder tucks up against the wall when not in use, but judging by how often Chloe was up and down those stairs, it will always be out. She loves it up there. Me, not so much. I never was afraid of heights (still love roller coasters!) but this space makes me feel a little woozy. I'm getting old! 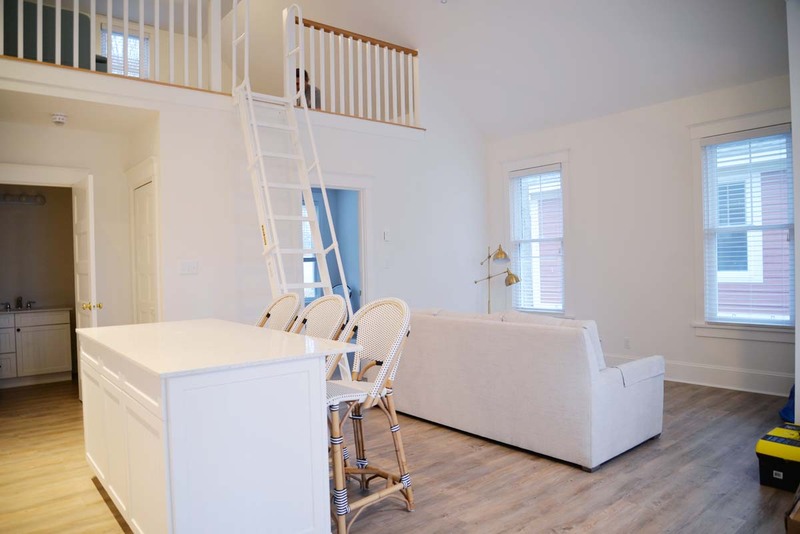 We had just enough time to assemble our sectional up in the loft before we packed up and closed up the cottage for the winter. It'll be open again in two months and I can't wait! I've stockpiled more furnishings and am excited to show you some of the plans for the rooms. The cottage is a blank slate which is exciting but daunting. Tell me, what would you do to this space? Would you paint? Leave it white? What colours would you use? So many possibilities! !